People from around the globe, more than ever, find social media becoming a hug impact on their lives and the way they run business. In the business setting, social media has forever changed the way we work. Moreover, companies have utilized social media to increase efficiency and collaboration at the work place. The economic value is shared among employees, executives, and other stakeholders. Great ideas are formed as a result of departments and employees being able to connect and have meaningful conversations in a timely fashion. Social media has created a new generation called Generation-C (connected, computerized, and community-oriented). These collaboration networks allow brain-storming activities, idea sharing, problem solving not only among employees at work but also among companies and vendors, suppliers, customers, etc. These social networks add promising values to the business world. There are various forms of social media and collaboration tools used by companies. The rise of Intranet 2.0 has added social media, including social networking, blogs, instant messaging, wikis, RSS, and discussion forums, into the evolutionary path of the social intranet. 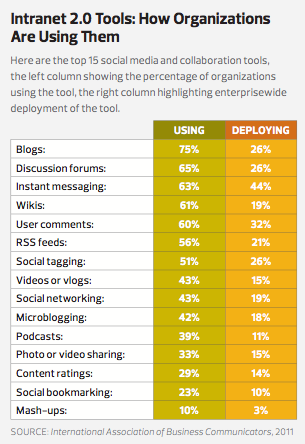 Social media Intranet 2.0 has become powerful tools for business collaboration. It is no longer just business marketing, but it acts as vehicles for employees to share knowledge and ideas. Tools such as Google Docs and Drop Box allows much faster delivery of documents and allows multiple users to shares and edits documents at the same time. Companies have made a large amount of investment in social collaboration software, which is predicted to grow into a $6.4 billion market in 2016, compared with $600 million last year. Social collaboration software refers to social media type of platform, allowing Unified Communications and Collaboration (UC&C) solutions including unified messaging, videoconferencing, advanced telephony, etc. Jacob Morgan cites in his book, “The Collaborative Organization” that business performance could increase by 36% by utilizing social collaboration software. McKinsey Global Institute reports that social technologies could raise the productivity of interaction workers by 20 to 25%. People are more productive and motivated when they are given convenient tools and some freedom and work place. Social media platforms such as Facebook, Twitter, and LinkedIn have become valuable resources for information and connections. Although the topic of employees SHOULD Facebook or SHOULD NOT Facebook at work remains controversial, 92% employers have been using or planning to use social media as a recruiting tool and search for talents. Social collaboration is also a great tool used by independent workers. Independent Workforce rises by nearly a million workers in 2012, with worker satisfaction rate at 86%. Interestingly, the report shows that the highest percentage of independent workforces is made up of the baby bloomers, followed by Generation X. This proves that not only the younger generations are adapting quickly to social media as a valuable business tool. Social tools could also motivate workers to work independently and virtually. This provides employees a culture of freedom to work remotely and extend the social circle regardless of different age groups, demographics, locations, etc. There are obviously many advantages of using social media and collaboration tools to increase business productivity and efficiency. It is often easy for us to see the advantages of something we love so much. Besides the internal benefits that social media provides to business, are there any disadvantages of social media as collaboration tool? Conflicts in working style: While with social collaboration tools, companies are employing better division of labor, there is also possible conflicts in working style among employees. This could create hold-ups on progressing the work. This could also delay decision making because people have different way to approach and prioritize work. Too many leaders: The advantage of sharing ideas and inputs could bring miscommunication. Too many people will try to take ownership of the collaborative work. As a result, creates tension among team members. This is where too much freedom in the workplace could make it difficult to manage. Potential costs as social network grows? Security of company’s information? Employee privacy? Let’s explore the bag and the ugly of social media as collaboration tools in later posts.